Over the years William G. Moore & Son, Inc. of Delaware has built an unequaled reputation for reliability and quality as a leading supplier for many high profile and important jobs. The construction of the World Trade Center, repair and maintenance of the Brooklyn Bridge, the DEW Line project in Alaska, boardwalks in Atlantic City, and the longest wooden bridge in the world, have all contributed to our reputation for excellence. Whether the job is large or small we are committed to satisfying our customers and their needs. 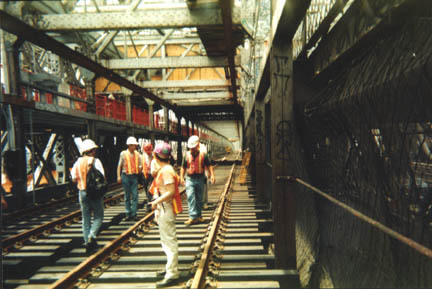 We have gone from supplying the Saudi Government Rail Road in the 1950's to proudly working with Koch/Nab - M-Track Enterprises in 1999 for all of the trackwork and treated crossties, switch timbers, and guard timbers for the Williamsburg Bridge Rehabilitation Project. The trackwork was successfully finished one-month ahead of schedule. In July 1989 the AAR Technical Center in Chicago performed a test on Ekki/Azobe entitled: "An Evaluation of the Properties and Likely Performance of Two Tropical Hardwood Species as Crossties in North America". (Copy available upon request.) Since then we have shipped over 100,000 Ekki/Azobe ties and blocks into the U.S. market for various projects. 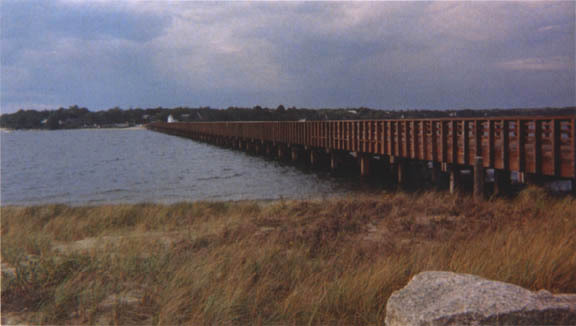 We have had the honor to supply the longest wooden bridge in the world, located in Duxbury, Massachusetts. This landmark bridge is 2,200 feet long by 27'8" wide, carrying 2 lanes of vehicular traffic plus a pedestrian walkway. The superstructure was supplied in 20' and 25' prefabricated sections of Ekki/Bongossi/Azobe, and the 550 piles were Basralocus/Angelique. Stress tests were preformed at Lehigh University and flammability tests were done by U.S. Testing Co. on these species and results would be available if requested. Some of our most recent jobs include: WR Cedar and Ipe for the Brooklyn Botanical Gardens, Ekki Lumber and Square Hewn Greenheart Piling for dock work in Boston, Dapped, End-plated, and Pre-plated Ties and Bridge Timbers for the Long Island Rail Road - Atlantic Avenue Viaduct Project, and many more! We have had the pleasure of supplying 1 million board feet of Western Red Cedar for the Saudi Air Ministry Building, as well as supplying Douglas Fir and Greenheart timber for the docks in Bahrain. We have supplied 1 million board feet of treated Southern Yellow Pine lumber and timber for the Sanitation and Queens West projects in New York City. 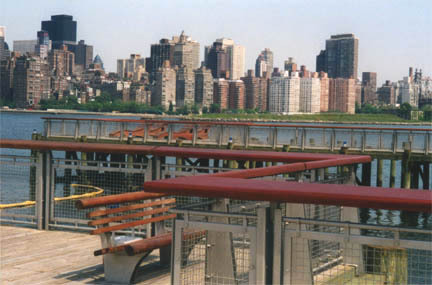 We have also supplied all of the Greenheart piling and timber for the Staten Island Ferry and Whitehall Street Ferry as well as supplying Greenheart for decking in several phases for the Brooklyn Bridge walkway. 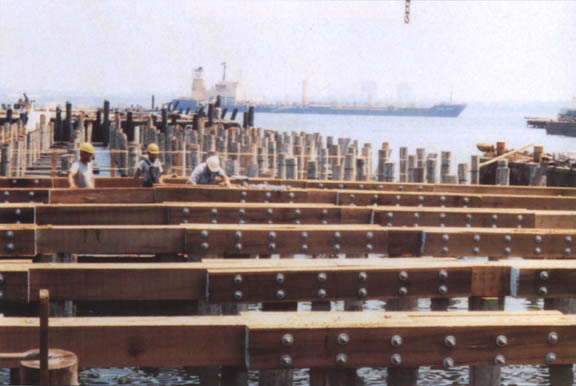 During construction of the World Trade Center we supplied lumber and timber such as 12"x 12" - 40's for foundation work. 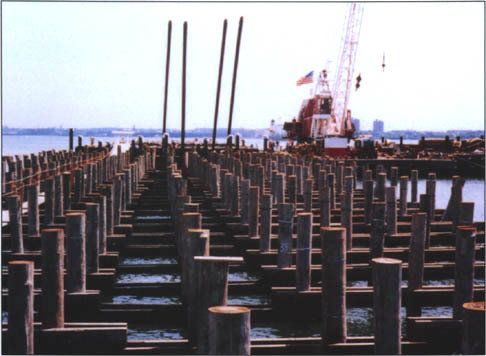 More recently we supplied treated southern yellow pine foundation piles for the John F. Kennedy Airport. Government projects include: The St. Lawrence Seaway, the Corps of Engineer projects in Sunny Point N.C. and on Governor's Island, and in Alaska, the Coast Guard project on Kodiak Island and the DEW Line project in the 70's and 80's. 2. 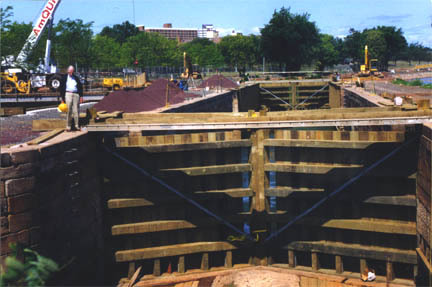 Historic D&R Canal restoration located in New Brunswick, New Jersey. W.G. Moore supplied all lumber and timber in Southern Yellow Pine - treated 2.5# CCA, including custom milled specialty pieces. Built in 1830, it was reopened as a state park in August 1998. We also supplied material to repair flood damage after Hurricane Floyd in 1999. 3. Staten Island Ferry - W.G. Moore supplied 2475 Greenheart piles for a total of 138,258 lineal feet of piling, plus all of the fender timber. Greenheart is up to three times stronger then pine or fir. It is naturally resistant to marine borer attack and decay, so it requires no treatment. 4. The Queens West - NYC Economic Development Project, is part of a plan to beautify and promote new development in depressed areas. W.G. 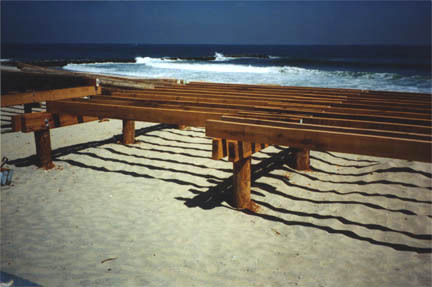 Moore supplied treated southern pine piling and walkway decking, and Purpleheart hardwood railing and bench lumber. 5. Avon by the Sea, New Jersey. Highly durable Greenheart hardwood stringers are visible before decking is installed. W.G. Moore supplied all the Greenheart lumber and piling for this construction. 6. Beautiful Ipe/Bethabara hardwood deck. 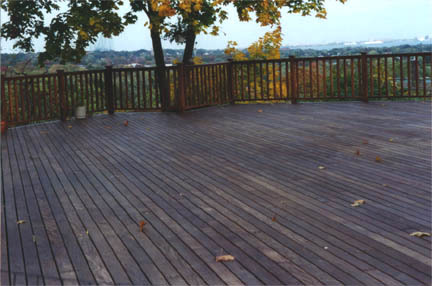 All decking and railing material for this private deck was supplied by W.G. Moore in low maintenance (No treatment or stain necessary), long life, natural hardwood. Along with Greenheart, Ipe is the material of choice for decking, used for years on Atlantic City, NYC, and Coney Is. Boardwalks.